My goodness, I am overwhelmed with so many emotions. YES!!!! You are seeing correctly. I AM OFFICIALLY A 2017 ARTISAN DESIGN TEAM MEMBER. And yes, I did just scream this from the roof top. Pinch me now. I will admit that I am a little nervous, however extremely excited and immensely honoured to be presented with such a prestigious award. 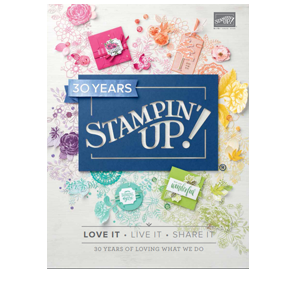 What is the Stampin' Up! Artisan Design Team? 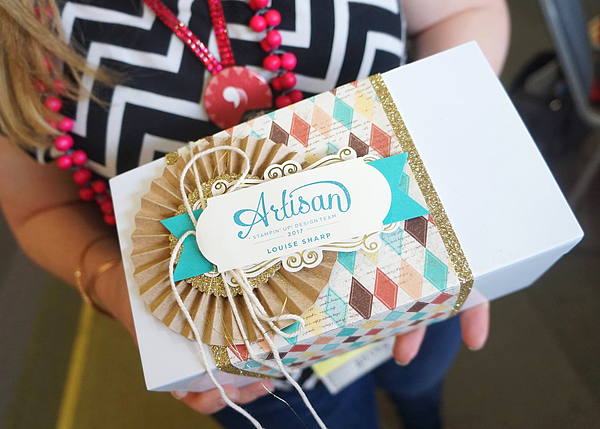 The Artisan Design Team is a group of very creative and talented Stampin' Up! Demonstrator bloggers who are selected by Stampin' Up! to create, post, and blog about the projects they create. When my name was called I couldn't control my excitement, jumping up and down and getting to personally squeeze Shelli and Sara - which is a thrill just in itself! 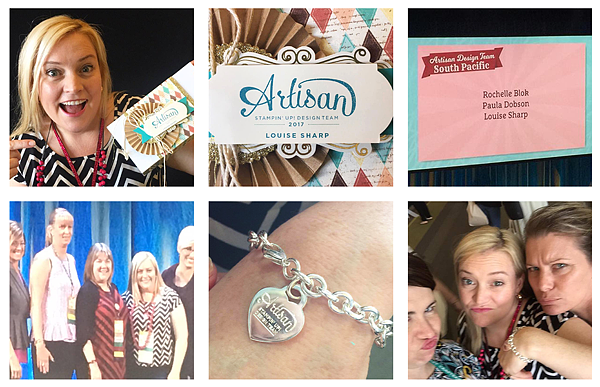 After walking off stage we were presented with this lovely gift box, which has my personal Artisan stamp and also a gorgeous Tiffany bracelet engraved with Artisan on it. 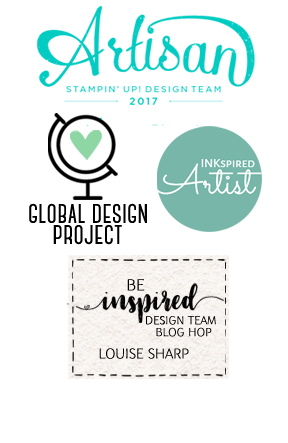 I am delighted to be sharing this role with some other amazingly talented stampers from around the world. There were three of us chosen from the South Pacific - Rochelle Blok, Australia and Paula Dobson, New Zealand. I didn't even open my gift straight away because I wanted to wait until I could record it so I could share the excitement with you all. Videographer: Kylie Bertucci. Even though being awarded with Artisan was one of the stand out moments, I had so many other memorable and enjoyable times. 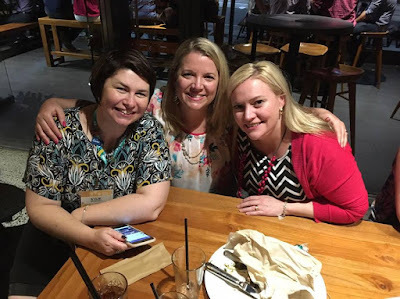 Getting to reconnect with my Stampin' sisters from around the country was one of them. 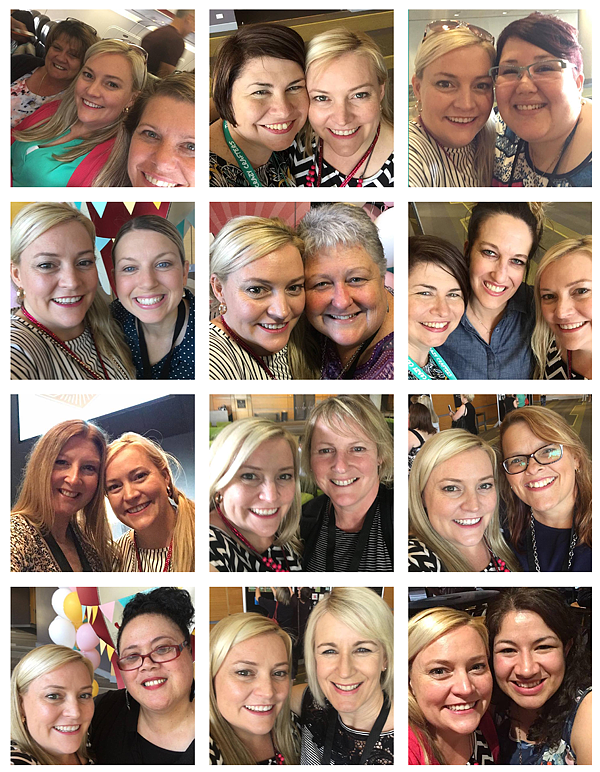 I stayed and travelled with my good friends Denita Wright and Narelle Macy; Kylie Bertucci; Ellen Woodbridge; Marni Cadd; Rhonda Bailey; Kylie Bertucci and Shannon West from Head Office, Utah; Carolyn Bennie; Jodie Griffith; Kym Byrne; Ana from Head Office, Australia; Angela Meiritz-Reid; Carolina Evans. 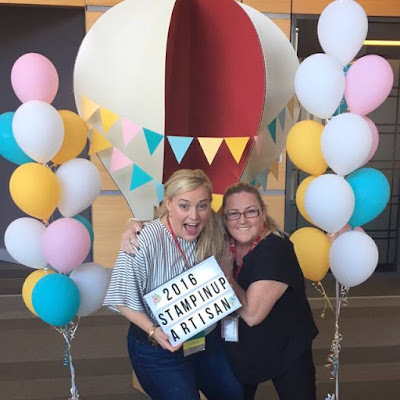 Another highlight of Onstage was getting to meet this lovely lady in the middle, Robyn Cardon from My Pink Stamper who travelled over from Utah, USA to enjoy Onstage in Australia. What a treat! I am also with my dear friend Kylie Bertucci from Victoria, Australia. She rocks and I'm so proud of her achievements this past year. Kylie was presented with so many amazing awards including making it into the Top 100 Demonstrators worldwide, not only that - she came #8! This places Kylie as the #1 Demonstrator in Australia. I'm so proud of her and so grateful for her friendship and support. I will be back with another Onstage post this week to share a sneak peek of some new upcoming products and more from the amazing time we had. The best part of these events is you get to be the first see and receive new product. Even if you don't get to go to the event, Stampin' Up! Demonstrators are given the opportunity to purchase first. Have you been thinking about joining? You should!! No pressure - you can find our more info about joining my team by Clicking Here. I'm so proud of you! I'm just disappointed that I wasn't there! Congratulations Louise!!! You are undoubtedly an artisan and a huge inspiration! 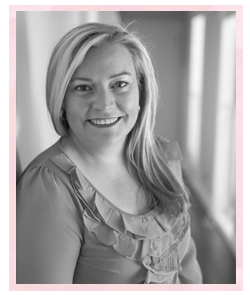 Congratulations Louise, I have been following your work for a while now and I'm so pleased for you. Your style and creativity is inspirational, can't wait to see what unfolds in the year ahead. ... it was so lovely to witness your excitement at Onstage. How exciting! Congratulations! I'm holding up my cup of coffee and cheering you this early morning! Thanks for all you do and share on your blog. Congratulations Louise on your Artisan award, brilliant work! Love the video, and your bracelet. Congratulations Louise!! I'm so excited for you. Look forward to following your journey - and that of your 2017 team mates next year. Congratulations to you all! What an honor? I just loved the packaging, I've been to Tiffany & Co. in New York. Loved it. Wee what you all share! I'll be excited to see what everyone shares! Again, Congratulations!